In the early fourth century, Emperor Constantine began transforming the pagan Roman Empire into a Christian empire. A key component of that change focused on Israel, the land of the Bible. Christian leaders, including Constantine's mother, identified the locations of biblical stories from the life of Jesus, the early Church and the Old Testament. At these sites, Christianity built churches and shrines where worshippers could commemorate those sacred events. In this way, the Church transformed the Jewish "Land of Israel" into the Christian "Holy Land." Through the centuries, Orthodox and Catholic travelers made these churches into pilgrimage destinations. For Orthodox pilgrims, even today, perhaps the primary activity at these churches is the veneration of icons contained in them. These paintings provide the pious a window to the individual portrayed, whether Jesus, Mary, or a saint. As St. Basil of Caesarea observed, "The honor paid to the image passes to the prototype." For the Orthodox, God is made real through the icons, which provide a physical symbol of the divine presence. While Orthodoxy reveres liturgy, especially during Holy Week, Catholicism has elevated liturgical observance even higher. This is particularly true for pilgrimage in the Holy Land, where the celebration of Mass in the churches at the holy locations constitutes a central activity of pilgrimage. The divine presence in the Mass's bread and wine, as Catholics believe, assures the faithful pilgrims that their pilgrimage has brought them close to God. Accompanying this is the practice of prayerful and meditative devotion, in which pilgrims at a holy site imagine the sacred events that happened there. Often they seek to imagine themselves as present in those past events. While the Stations of the Cross comprise the most widely known collection of these locations, nearly all sacred sites serve as foci for such meditation. Protestant travel to the Holy Land takes on a totally different character. Instead of seeking out the churches at holy sites, Protestants avoid them. Their Holy Land experience emphasizes the land itself and its connection to Jesus. As Professor Tony Cartledge of Campbell University observes, "They want to walk where Jesus walked, to weep where Jesus wept, to sleep in some proximity to where Jesus slept." Cartledge continues, "Protestants love the Sea of Galilee because they know Jesus was there and no one has contrived to cover its stormy waves with a stony church. They love the Garden Tomb and Gordon's Calvary because those sites fit their biblically inspired imaginations much better than the sooty stone and polished marble found in the Church of the Holy Sepulchre." Despite its lack of a centuries-old designation as sacred, Protestants favor the Garden Tomb because it is a garden where one can worship among the scents of native flowers, the shade of indigenous trees and the songs of local birds. Archaeological sites also comprise favorite places for Protestant tourist pilgrims. Here, the earth of the ancient land lies exposed. At Megiddo, pilgrims are guided through the city's development through the centuries spanning the Old Testament. At Capernaum, the excavations have uncovered dirt layers on which Jesus may have strolled. As Cartledge comments, Protestants "love to visit Capernaum because it still has the look of a simple village where Jesus visited the home of his friend Simon Peter." Few of the buildings uncovered there come from the first century of Jesus, but they are only a century or two later. The archaeological excavations and restoration done primarily for historical study and preservation also provide Protestant visitors with religious inspiration for understanding Jesus and the biblical record concerning him. In the end, Orthodox and Catholic Christians visit the Holy Land created through the architectural ornamentation of churches and shrines. Protestant Christians visit the land itself, discovering Jesus' home by viewing the territory and visiting archaeological excavations, but largely ignoring the religious monuments by which Christianity made it holy. I want to thank Tony Cartledge for sharing with me a copy of his essay, "Walk about Jerusalem: Protestant Pilgrims and the Holy Land," presented April 23-24 at a Duke University conference on "Archaeology, Politics, and the Media." Other information can be found in the following articles: G. Bowman, "Christian Ideology and the Image of a Holy Land: The Place of Jerusalem Pilgrimage in the Various Christianities," Pp. 98-121 of Contesting the Sacred, edd. by J. Eade and M. Salnow. New York: Routledge, 1991. C. Lock, "Bowing Down to Wood and Stone: One way to be a Pilgrim." Pp. 43-87 in Imagining the Holy Land, ed. by B. Long. Bloomington, IN: Indiana, 2003. How Should Archaeology Reach its Public? The following opinion piece was written for Bible and Interpretation (http://www.bibleinterp.com), a website that aims to bring scholarship in Biblical Studies and Archaeology of the Ancient Near East to a broader public. I post it here for interested Religion Today readers. Thanks to the efforts of Ann Killebrew, the new editor of Near Eastern Archaeology, the Forum in NEA’s September 2008 issue makes clear what many of us have feared. When it comes to TV documentaries, archaeology gets no respect. While shows about archaeology may be popular with audiences, the clear point of the three main essays featured in “Archaeologists and the Media” is that archaeologists and their knowledge-based views are not popular with those who make such shows. As far as the producers are concerned, archaeologists are only important to lend tacit approval of and authority to the point made by those in charge of the documentary. Eric Cline begins by castigating TV for producing sensationalized shows supposedly based on archaeology but which use archaeological expertise only for window dressing. According to Cline’s essay, “TV and the Near Eastern Archaeologist,” these programs—with topics such as Noah’s Ark, Sodom and Gomorrah, and Ark of the Covenant—focus on mysteries rather than history, secrets rather than archaeology, treasure hunting rather than education. Cline argues that the problem lies with the producers of such shows, who are woefully ignorant about proper archaeological procedure and evidence. He calls for archaeologists to work with such producers and educate them, using any helpful means to bring real archaeology into the programs. If the three essays provide a single conclusion, it is this: TV archaeology is about “compelling storytelling.” Few of the archaeological storytellers are archaeologists themselves, and so the stories being told are not those the field would tell. Archaeologists, furthermore, are lousy storytellers, so until they change, they will remain unsuited to tell archaeology’s own stories. When we cut through the metaphors of “story” and “franchise,” the question boils down to this: How do we communicate archaeology to the interested public? Here are three suggestions. This is a good beginning, but it will not accomplish Cline’s goal. Only undergraduates could possibly have the time to take more than one such course, given graduate students’ already overwhelming schedule expectations. And it will take years for such changes to take effect. Instead, archaeology should lead with its strength, specifically, teambuilding. All successful excavations require the formation and management of a team, one usually consisting of experts, mid-level supervisors, and trainees. Few excavation leaders know how to do every task and every form of analysis required in an excavation; they bring in others to do them. Apply the same principle to making documentaries: put together teams to tell archaeological stories. Universities and colleges contain a multitude of experts in filmmaking, scriptwriting, and storytelling. They inhabit departments of Communication, Journalism, English, and Theater. Archaeologists should bring them on board, tell them what they want to communicate, and let them help work it into an interesting and filmable story. Bring in colleagues from history, classics, and ancient studies to help tackle a topic broader than the archaeological data. Furthermore, many institutions have TV studios and cameras, as well as editing and duplicating equipment. Rather than thinking we cannot do anything without the National Geographic or Discovery channels, we should realize we have access to the resources to tell our own tales. Second, OK, once a team comes together, what story should archaeologists tell? Is archaeology stuck telling tales of “Adventure, romance, treasure hunting, solving mysteries,” as Ann Killebrew writes in her book review? Certainly that seems to be Holtorf’s message at first reading. But I think we can understand his observation in a second way. He said, we recall, that archaeology makes the “adventure more adventurous, the mystery more (or less) mysterious, the revelation more pertinent.” In other words, archaeology helps a story be better; an adventure story becomes more exciting and helps explore a mystery or solve it. So if archaeologists tell their own story, then the use of archaeology can help that story be more interesting. With a creative team of filmmakers, scriptwriters, and storytellers, archaeologists can break out of the mold of mystery, secret, discovery formulas where the entertainment comes from the non-archaeological host rather than from the archaeological story itself. Archaeology and its finds are exciting to the interested public. Archaeologists are not just purveyors of factoids—even though these shows often represent them that way—but constitute pursuers of broader and deeper understandings of antiquity. Rather than take these formulas as the only way an archaeological story can be told, let’s look to other models and see what they inspire. I suggest James Burke’s Connections or Sister Wendy’s Story of Painting. Maybe Simon Schama’s A History of Britain might inspire new modes of storytelling. Even Ken Burns’ The Civil War could be suggestive; antiquity is not littered with letters, but there are some from the cities of Canaan, Egypt, and other urban areas. Archaeologists also need to be thinking about the message they want to deliver. Most archaeologists in the USA are teachers. They are not trained in producing mere “factoids,” even if that seems to be the way filmmakers package them, but rather approach their subjects with much broader perspectives. Classroom topics are not narrow, but broad. Smaller, specific examples are used to illustrate larger, important principles or conclusions. Discussion of archaeological sites and excavations are interpreted in the light of historical questions and knowledge. Sy Gitin, one of the excavators of Tel Miqne, for example, took part in a larger project trying to understand patterns of trade and migration in the Eastern Mediterranean. Archaeologists also address process and method, which can be interesting in and of itself, to teach students in how we actually draw conclusions about the past. Archaeologists have many interesting things to convey to an interested audience; they just need to get away from thinking that only TV or documentary producers can produce interesting materials. Third, where do we tell those stories? Despite the Forum’s title of “Archaeologists and the Media,” the essays really only focus on one medium, that of television, and ignore the rest. And, despite this blinkered view, if there is one point that the three essays agree on, it is that TV has not been very cooperative in letting archaeologists tell their own story. The fault seems to lie in the medium’s very structure. As Silberman says, “Today’s five-hundred-channel cable TV spectrum…is a chaotic, noisy, public marketplace that succeeds by stimulating the viewers’ strong emotions—strong enough to keep them watching a certain channel, and not surf away during the commercial breaks that pay for everything.” TV is both a highly competitive and a decidedly commercial medium. Channels display what pays, and what pays are the shows that make a station competitive on a large scale. Archaeology is not a commercial enterprise. Sure, excavations burn through large amounts of money to carry out their work, but the end product is a dig report which aims to enhance the understanding of the site, and hopefully, a variety of contributions to a broader understanding of the ancient world in which it participated. Most digs produce a few interesting artifacts to be displayed in museums. None of this is money making. So why should archaeology subject itself to a medium in which the almighty dollar reigns supreme? TV is a poor choice for those who want to achieve accurate representation of archaeology. A better match for achieving the goal of communicating archaeology to the interested public is the Internet. Most people over 40 have yet to realize the sea-change in communication that the Web represents—one that has already happened among younger generations. For example, I picked up a new habit from my students; I watch TV with my laptop. When a show makes an interesting remark about science, or history, or archaeology, or literature, I’ll Google it to learn more. If it is a nature question, I’ll often wind up on an environmentalist website, or a nature society website (think Audubon Society). If it is a medical question, I usually come to a site sponsored by medical society, a drug company, or a research team. If it is literature, I may find the actual text of the literary work. If it is Bible or Near Eastern archaeology, however, I am more likely to wind up at Wikipedia—if I’m lucky. The academic field of Near Eastern archaeology lags behind in taking advantage of the Internet. This is a shame. As the Obama campaign demonstrated on a large scale, the Internet enables the delivery of one’s own message to interested parties without the filter of TV pundits and producers. It was a triumph over the very problem that Eric Cline bemoaned in his essay. So how could Near Eastern archaeologists use the Internet to disseminate information about archaeology? Well, to improve my internet-assisted TV viewing, they could contribute more frequently and extensively to sites like Bible and Interpretation. This site has worked to bring archaeological results to the public, to provide explanations and interpretation of archaeological finds, and to support debate of historical and archaeological issues that are accessible to an educated and interested public. Professional archaeologists and their students could create their own wikipedia, known as a “wiki” these days. Rather than let anyone write anything, a wiki focusing on Near Eastern archaeology could incorporate the vetting and editing of articles. Archaeological digs could bring a writer onto their excavation team whose responsibility was to post a regular blog about each day’s activities and finds, along with photographs. If such a blog included interpretive discussions with a site’s chief archaeologists, it could provide some of the “spade work” for the season’s preliminary report. If it is video imagery that we want to replace the poor TV programming, YouTube and other video sharing sites provide distribution locations for materials. While archaeologically oriented postings will probably not gain the millions of viewers attracted by some “virus videos,” YouTube is actually a good place for more serious material. More importantly, it can host video material in tandem with a website much more cheaply than such a site can do by itself. The Bamburgh Research Project at Bamburgh Castle in Northern England has experimented with video in several ways (http://www.bamburghresearchproject.co.uk/index.html). A few postings appear on YouTube, but more importantly the excavation team includes a media department that records all the site’s work. These recordings provide the material for several media-based ventures. Other Internet tools may prove useful. Social networking sites such as Facebook and Twitter help attract attention and enable groups to keep in touch. Distance education schools have been experimenting with ways to use them in teaching. Indeed, distance education is a good place to learn how different Internet techniques and tools can be used. Many organizations are already working in different ways to bring archaeology online. Museums such as the one at the Classics and Archaeology Virtual Museum at the University of Melbourne (http://vm.arts.unimelb.edu.au/) and the Cobb Institute of Archaeology (http://www.cobb.msstate.edu/) have created online digital databases of archaeological information as well as virtual museum tours. And many of us have seen the virtual exhibits of the Dead Sea Scrolls. Organizations like ABZU (http://www.etana.org/abzu/) have been working to make out-of-copyright archaeological treatises available online. Now with hundreds of volumes available, there is more scholarly material online concerning Near Eastern archaeology from the early twentieth century than from the early twenty-first century. I could continue listing Internet tools and giving examples of how different archaeological organizations have used them, but the essay’s point is clear. The question of Archaeology and the Media is not “How does archaeology relate to the media?” but “How does archaeology communicate its message to the public and what are the best media forms for that task?” The Internet provides a new paradigm for accomplishing that goal, one that can potentially reach a wider audience than the media forms of TV (and newspapers) that dominated the latter half of the twentieth century. Given the failure of those old media forms to serve the needs of archaeology, it is time to move on. When I travel, I often visit religious buildings and sacred sites. 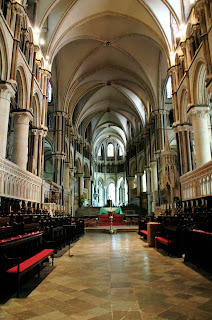 On a recent trip to England, I toured the cathedrals at Canterbury and Durham. Canterbury Cathedral has been the premiere cathedral of the Church of England since the 12th century and the center of the Anglican Church since its founding in the 16th century. Meanwhile, Durham may be the most picturesque cathedral in Britain; situated atop a hill in a bend on the river Wear, it dominates the surrounding countryside. The exterior of each cathedral impresses the viewer with its majesty and imperial character of its architecture. But upon entering, one is struck with a sense of emptiness. The interiors are quite plain, emphasizing the soaring architecture, but seemingly without further decoration. This is because the present decoration of these buildings results from the transformation of English Christianity from Catholic to Protestant. The cathedrals of Canterbury and Durham were built about the same time. The present Canterbury cathedral was erected between 1067 and 1077. Durham's cathedral was begun in 1093 and completed over the next 40 years. Both cathedrals formed the center of a monastery and both contain the tomb of a saint. They thus became important pilgrimage destinations. St. Thomas Beckett lies at Canterbury and St. Cuthbert at Durham. As monastery, pilgrimage center, bishop's seat and place of worship for the community, each cathedral received a great deal of decoration in the decades and centuries after their construction. Their current plainness is not reflective of their early history. While we know little about these cathedrals' furnishings, a comparison with cathedrals that still retain their medieval character is suggestive. The basilicas of Italy, for example, remain ornate. The walls and ceilings of the older basilicas in Rome are decorated with statuary, carvings and paintings; the Bergamo basilica is covered with paintings and woven tapestries, while the interior of Venice's St. Mark's Basilica is covered with gold mosaics from floor to ceiling. All these cathedrals have extensive collections of silver and gold candlesticks, offering plates and other liturgical items -- often encrusted with valuable jewels. While it is unlikely there was much gold artwork at Canterbury and Durham, it is likely that they had many paintings, statuary and tapestries, along with many valuable liturgical utensils. In Durham, there are a few shadowy remains of artistic scenes on the wall, indicating that it was once covered with large, colorful murals. Rather than being plain and empty, in their early centuries the cathedrals of Canterbury and Durham were crowded with artistic and religious items serving the needs of the cathedrals' varied constituencies. So how did these cathedrals become so plain? In the 1520s, King Henry VIII could not conceive an heir with his current wife, so he asked the pope to annul his marriage so he could (hopefully) marry a more fertile woman. The pope refused. In response, King Henry withdrew his country from the Catholic Church in 1534 and created the Church of England, with himself as its head. By 1536, he realized the enormous wealth the church controlled and began to appropriate it for the crown. In 1538, he ordered St. Thomas' shrine in Canterbury destroyed and its vast hoard of treasure and gifts confiscated. In 1539, both Canterbury and Durham monasteries and their cathedrals were closed. The cathedrals were reestablished in 1541. These actions of King Henry began the despoliation of the two cathedrals, and by the end of the 16th century most of their medieval furnishings were gone. Anything that remained at Durham into the 17th century was destroyed when Puritan leader Oliver Cromwell used the cathedral as a prison for 3,000 Scottish soldiers in 1650. Other cathedrals and monasteries across England and Wales were treated similarly. Although the treatment of these monasteries and cathedrals in King Henry's time and later was essentially looting, the resulting plain look of the cathedrals fit well with the growing influence of Puritan theology in the now-Protestant Church of England. Puritans desired to "purify" the English church of what they considered to be the mistakes inherited from the Catholic Church. One of these mistakes was the widespread use of art in places of worship, which made them seem "idolatrous," the Puritans believed. Once the cathedrals and churches became plain, they were left that way until modern times.